Global Keratin is the first and only company to harness the superior beauty benefits of Juvexin. By infusing hair with pure Juvexin, critical amino acids and proteins remain intact. Derived from healthy pristine sheep wool through an environmentally-friendly process – it works on all hair types leaving it more manageable, soft, shiny and frizz-free for up to 5 months between salon treatments. Want smoother hair? We offer this treatment at Salon Muse! Even better?? 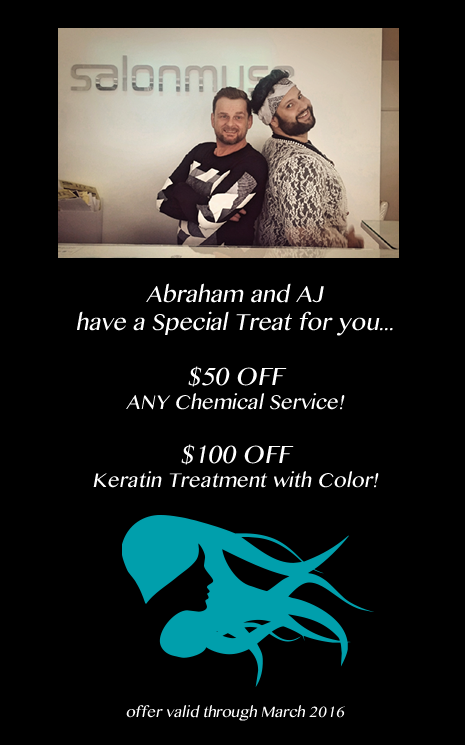 AJ and Abraham are offering a special on Keratin Treatments now through the end of March 2016! Book your appointment today!